William Stockton is documented as being the first policeman in 1871 with Frank Linville and Will Gamble being documented as police officers in the late 1890’s. In the early 1900’s, Kernersville operated under the constable form of law enforcement, which often required lighting of the street lamps as well as the “keeping of the peace”. One of the Town’s noted constables was George Fontaine whose law enforcement career included membership in the North Carolina State Highway Patrol and service as Assistant Sheriff of Forsyth County under Sheriff Ernie Shore, the longest serving Sheriff of Forsyth County. 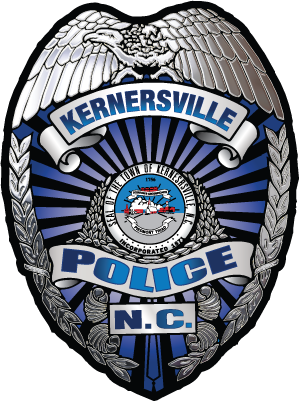 Unfortunately, much of the early history regarding the activities of law enforcement in Kernersville has been lost, until the early 1940’s when the Kernersville Police Department, as we know it today, came into existence. It is somewhat remarkable that over the past seventy plus years, the Town of Kernersville has had only seven Chiefs of Police. The first known Police Chief in the 1940’s was Chief Matthews, who hired and worked with Police Officer Dewey Sykes. Later, Dewey Sykes served as Chief of Police from 1945 through 1966, a period in excess of 21 years. Chief Grady H. Stockton served as Chief of Police from 1966 until 1984, a period of 18 years; and, his son, Chief Grady C. “Neal” Stockton, was the longest serving Chief of Police serving from 1984 to 2009 a period of 25 years. Chief Kenneth W. Gamble served for three years from 2009 until 2013. Chief Scott A. Cunningham served as Chief of Police for 4 years, from 2013 to 2017. Chief Tim Summers has lead the Kernersville Police Department Since 2017. The Kernersville Police Department houses its base of operations in the Stockton Law Enforcement Center. The naming of this center was established by resolution of the Board of Aldermen on October 6, 2009, upon the retirement of the former Chief Grady C. “Neal” Stockton, 1984-2009. Chief Stockton followed in his father’s footsteps, Chief “Grady” H. Stockton, 1968-1984. Together these dedicated men served the Town of Kernersville in law enforcement for over seventy years. The entrance of the Stockton Law Enforcement Center is flanked by the Protector Statue inscribed with the words “To wear the badge is a choice; To serve the public is an honor.” This statue symbolizes the trust and confidence that the citizens of the Town of Kernersville can expect. Located in the heart of the downtown area, the police department is steeped in time-honored tradition and history. An officer can still be seen walking the beat downtown, standing at attention with head bowed and hand over their heart as a funeral procession goes by and where vehicle unlocks and jump starts are still a service to our citizens.